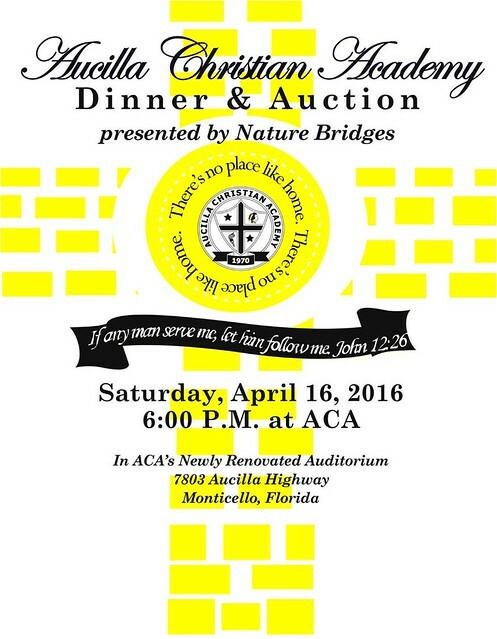 When Aucilla Christian Academy supporters gathered this year for their annual “There’s No Place Like Home” dinner and auction, presented by Nature Bridges, on April 16, 2016 in ACA’s newly renovated auditorium, it was a special homecoming experience. Guests were treated throughout the night with a special “ACA Life” slideshow, singing by students Chloe Reams, Brittany Hughes, Dena Bishop and Stephanie English, who performed "At the Cross” by Hillsong, and senior Taylor Copeland who gave her testimony about her life-changing experience at ACA “where Christ is truly first in all things,” she said. The emcee for the night was ACA alumnus David Jackson with auctioneer Steve Burton and his wife, Margie. Dinner was served by ACA’s student ambassadors and catered by Covington’s of Valdosta and included: rosemary roasted half Cornish game hen with apples and cranberries, roasted salt and spice packed pork loin with sage and brown butter, mixed greens with oranges, spiced walnuts and dried cranberries with lemon-cilantro vinaigrette, green beans with pancetta, smashed new potatoes with saffron chive butter, yeast rolls, chocolate lava cake with espresso whipped cream and pecan pie. ACA appreciates its supporters and would like to thank each and every donor and buyer. The raffle winner of the Vera Bradley luggage was Johnnie Pelt; Jennefer McLeod won the Steel’s Jewelry diamond necklace. To view photos from the event (click graphic above) and the catalog of prizes generously donated by ACA donors on Facebook.com/aucillachristianacademy. For information on ACA, call 850-997-3597 or visit aucilla.org.